Today, we’ll be talking about everything in regards to sump pumps! While you certainly hope you’ll never need the services of a sump pump, it can potentially be one of the smartest investments you’ll ever make. 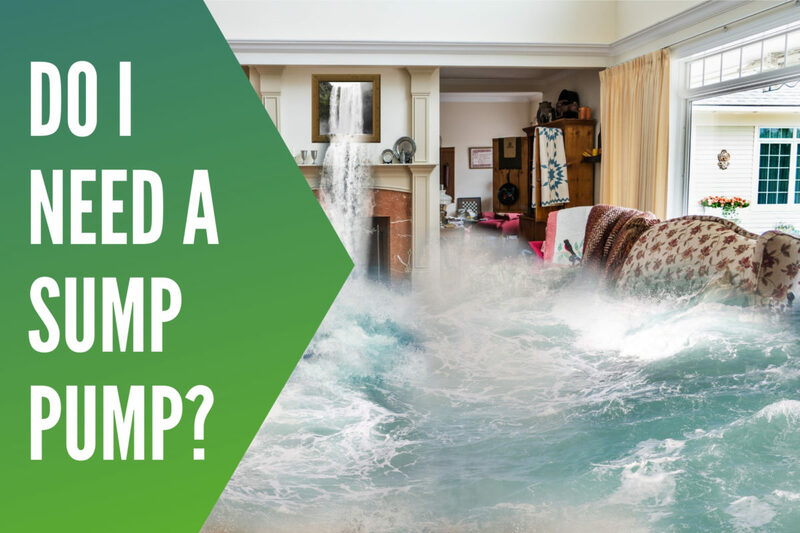 Our team gets asked all the time, “Do I need a sump pump?” In nearly 95% of situations, we immediately say, “YES!” The best way to describe it is by comparing it to an insurance policy. You are making an investment of a back-up plan, in case something drastic were to happen. For those that are curious what a sump pump even is, it’s a quick and easy answer. Sump pumps are installed at the lowest point in your basement and designed to remove water. The methodology behind it is just as cut and dry as the installation location. Through a filter trap, it draws in the water and then redirects the water away from the home’s foundation with the discharge pipe. With sump pumps, you can choose from the (1) Pedestal Pump (motor is above the sump pump) and (2) Submersible Pump (totally submerged). The submersible is always going to be a more expensive option, but both can be effective options in the majority of scenarios. Yep, that’s right! You can actually increase the value of your home with a sump pump. Obviously, it’s not going to increase it drastically, but it can make it more appealing to a potential home buyer. Consider this if you were in the market to purchase a new home: Would you rather get one that’s always dry when it rains or one that routinely floods each storm? For those that have spent the money to finish their basement, I’m sure it wasn’t a cheap project. It likely required a significant investment. Additionally, some homeowners might utilize their basement as a storage area. Now, take a look at your finished basement, what would happen if water were to get down there? Going back to the top of this post, sump pumps are a terrific, affordable insurance policy. By far, the top reason why you need a sump pump is to keep your basement dry. As mentioned before, when the pump starts filling up with water, it automatically starts shooting it away from the foundation. On each sump pump system, there’s a check valve between the pipe and the pump. This valve has one purpose: prevent any water from coming back into the house. When you invest in a sump pump installation, you’re getting an investment that will last awhile. Thanks to it’s durability and longevity, this is part of the reason why it makes so much sense to go ahead and have one installed just to be safe. With both types of sump pumps, you’re going to get a solid 10 years of activity. After that, it would be wise to get it checked out! The number one goal behind a sump pump install is protecting the visible parts of the house. However, most homeowners don’t consider the effects it has on the area below the house. By keeping this part dry, you’re protecting yourself from mold and mildew. Mold can not only have a crippling effect on a building’s overall infrastructure, but it can also cause serious health risks to all occupants. A sump pump is a perfect insurance policy, but it isn’t 100% fool-proof. Sump pumps are directly tied into the home’s power supply. With this being the case, if the power were to go out, chances are you could lose your sump as well. An easy way to combat this would be having a generator handy. Although it would require an initial investment, it would definitely be better to be safe than sorry! Curious as to whether you need a sump pump? Or just want to see if your current one is properly maintained? Don’t hesitate to reach out to our team today. We’d rather get it taken care of now, rather than dealing with a flooded basement at 4 in the morning!